On his long-awaited debut album, B.o.B’s “Bobby Ray” persona – the pop half of his rapper/singer personality – emerges with a vengeance. He bookends rhymes with earnest, dreamy vocals like “Let Me Fall” and “Past My Shades,” and invites Bruno Mars (“Nothin’ on You”) and Hayley Williams from Paramore (“Airplanes”) to contribute hooks. Rapping alongside Eminem, Lupe Fiasco and T.I., B.o.B announces his hit-making potential in an emphatic and surprisingly confident way. 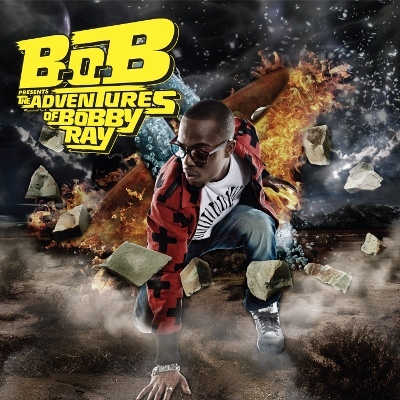 The Adventures of Bobby Ray may not be what fans of underground anthems like “Haterz Everywhere” expected, but it’s entertaining all the same. This entry was posted in Reviews, Short Cuts and tagged Atlantic, B.o.B, Rhapsody. Bookmark the permalink.